The first teaser and a new poster for Teen Titans Go! to the Movies has arrived. The full trailer for the Teen Titans Go movie is set to debut tomorrow, but Warner Bros. decided to give us a very brief tease, which features Robin promising something big is coming. While there's no actual footage from the animated feature in the teaser, it gives an idea of what to expect in terms of tone, which is right in line with what fans have come to expect from the Cartoon Network series. Teen Titans Go! To the Movies also has a new poster, which boasts the tagline, "The superhero movie to end all superhero movies. Hopefully." It features the gang sitting in chairs getting ready to film their very own movie. As it turns out, this movie is actually going to be something of a commentary on superhero movies in general, as the Teen Titans head to Hollywood to try to get their own movie made. Here's there official synopsis for Teen Titans Go! To the Movies. "It seems to the Teens that all the major superheroes out there are starring in their own movies, everyone but the Teen Titans, that is! But de facto leader Robin is determined to remedy the situation, and be seen as a star instead of a sidekick. If only they could get the hottest Hollywood film director to notice them. With a few madcap ideas and a song in their heart, the Teen Titans head to Tinsel Town, certain to pull off their dream. But when the group is radically misdirected by a seriously super villain and his maniacal plan to take over the Earth, things really go awry. The team finds their friendship and their fighting spirit failing, putting the very fate of the Teen Titans themselves on the line!" That sounds potentially fun, very tongue-in-cheek and, perhaps, a tiny bit like The Muppet Movie in some ways. Warner Bros. has an excellent track record with their animated DC movies, but they rarely release them in theaters. Since there isn't another live-action DC movie coming out until December when Aquaman arrives, that made room for Teen Titans Go to transition from the small screen to the big screen. 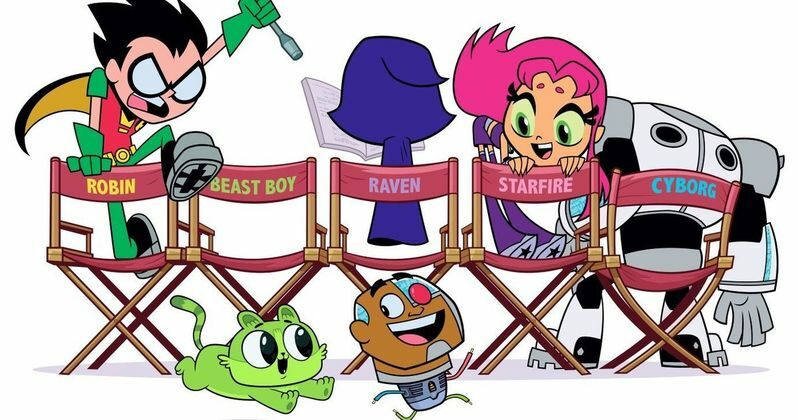 The core voice cast from the Teen Titans Go series are all on board for the movie, with Greg Cipes as Beast Boy, Scott Menville as Robin, Khary Payton as Cyborg, Tara Strong as Raven, and Hynden Walch as Starfire all featured. The cast also includes Will Arnett (The LEGO Batman Movie) and Kristen Bell (Frozen). Be sure to check out the new poster and trailer teaser for Teen Titans Go! To the Movies, courtesy of Warner Bros. Pictures, for yourself below and be sure to check back for the full trailer tomorrow.